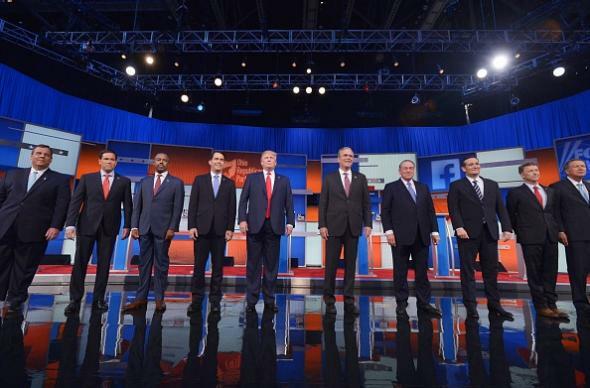 Fox News debate ratings: Republicans, Trump score high on overnights. The candidates in Thursday night’s 9 p.m. debate in Cleveland. As Stelter says, that’s a preliminary number (see the definition of overnight ratings here), and Nielsen will release a more carefully calculated estimate later today. But for comparison, the overnight rating for the last game of the NBA Finals in June was 15.9; that was considered a very good number for the NBA and ended up translating to an estimated 23 million total viewers. The first 2012 debate between Barack Obama and Mitt Romney got a 27.0 overnight rating—but it was broadcast on four networks rather than one cable network, and it took place a month before the general election rather than 15 months. I’m not a professional political analyst, but I did stay in a Holiday Inn Express last night and it does seem to me like this news means that whoever ends up getting the Republican nomination will have great early name recognition and will have Donald Trump to thank for it.